On 8 December 2017 the Directorate‑General for Communications Networks, Content and Technology (CONNECT) organized an information day to present photonics calls under the Horizon 2020 Research and Innovation programme. The Work programme 2018-2020 “Information and Communication technologies” of H2020 supports core ICT industries through roadmap-based Public Private Partnerships (PPPs). Photonics21, one of these PPPs, brings together more than 2500 members and 1700 organizations. 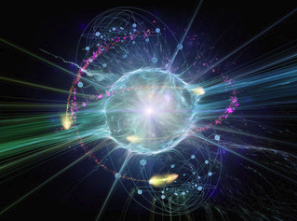 It is open to all photonics-related companies and research institutions. Interested organizations just have to fill in application form to express their interest to participate. This partnership was launched to better align EU research and innovation priorities with industry’s needs and increase R&D spending in photonics. Europe has a strong leadership in this sector, but is affected by the completion with Asia (China, Japan, South Korea, Taiwan), as reported in a recent market research study. For this reason, the European Commission is increasing its investments in this area, and Horizon 2020 allocated € 700 M to photonics. The research priorities of the actual photonics calls in Horizon 2020 have been defined based on the recommendations expressed by the photonics stakeholder community. 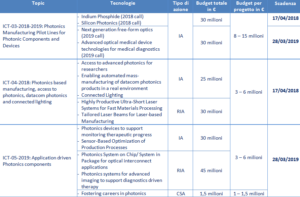 Up to this point, the EC has funded 67 Photonics PPP Projects under the frame of H2020 to the tune of approximately € 278 M. An overview of all PPP Projects started so far, as well as the brief description of their objectives, can be found on the website of the Photonics21. The Commission stressed the importance of building on previous projects activities, results and infrastructures, so is highly recommended to check existing initiatives. • Photonics Manufacturing Pilot Lines for Photonic Components and Devices. The challenge is to help European companies become more competitive. This can be done by improving their business/production processes as well as products and services by means of photonics technology. The call covers 4 technologies (see following table). At least one proposal will be selected to cover each of these technologies. Currently there are 4 photonics manufacturing pilot lines running: PIX4LIFE, PI-SCALE, MIRPHAB e PIXAPP. • Photonics based manufacturing, access to photonics, datacom photonics and connected lighting. The challenge is to reinforce the innovation ecosystem by providing access to advanced photonics technology to researchers. This will accelerate the deployment of the next generation of disruptive photonics technologies. LED/OLED lighting is now becoming the dominant lighting technology and the market focus is shifting from energy efficiency to additional smart features. The challenge is the integration of lighting with the Internet of Things, offering new functionalities beyond illumination. • Application driven Photonics components. 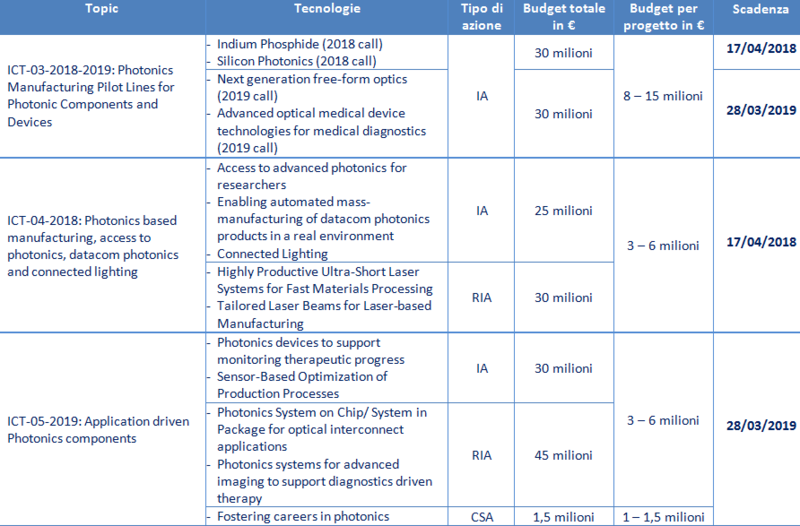 Photonic technologies for health applications is a very promising field, where the EU has produced significant results during the past decades. However, industrialization is still lagging behind. The challenges are to develop methods that provide the clinicians with photonics enabled tools to improve or to assess the successes of therapies and to transform low TRL technologies into robust medical devices answering to clinician needs. – Exploitation strategies: well thought-though, complete, and concrete enough, coherent and consistent with the proposal implementation. Do not postpone exploitation strategies until the project starts. – IPR: strategy for management of IPRs outlined in the proposal. – All successful proposals covered all or major part of value chain, include partner for industrialization and are driven by end-user needs. – The involvement of industrial partners is fundamental. For RIAs commitment must be clear from including relevant industrial partners and by giving convincing exploitation strategies. In IAs a commitment to the commercialization needs to be demonstrated. – Key performance indicators: be specific regarding what you want to achieve, how you will measure it and define targets. The different funding schemes are meant for different types of projects, it is important to be 100% consistent with the topic description to be funded.